Rowan University is located in Glassboro, New Jersey. If you have seen Glassboro, you wouldn’t exactly call that horse country. Numerous students at Rowan share their passions for horses through Rowan University’s Equestrian Team. The team meets for lessons on Fridays at Liberty Bell Farm, which is located in Elmer, New Jersey and run by Denise Bell. I actually got into horses and took lessons there for years. It’s funny how small this world actually is. From campus, it is about a 15 minute drive. The team also meets to complete service projects such as, bake sales, volunteering at horse shows and making canned food donations. Also, I’ve done a brief question and answer with Rowan Equestrian Team’s president, Sarah Gemmell! Above is a photo of the team’s logo, designed by Sarah. Please, it is only used for Rowan University Equestrian’s Team. Q. What is your favorite part about being the president of Rowan’s Equestrian Team? A. My favorite part of being president is getting to know everyone and working with each person to fit their needs. I am learning a lot about myself and other people through this process. Also, I think the experience of leadership will continue to benefit me for the team’s sake and even outside the team. Q. How long have you been around/familiar with horses? A. I have been around horses my whole life (20 yrs) and been riding for about 17 of those years. Q. How many horses do you have? Where is/are they kept at home? What’s is/are their name(s)? A. I only have one horse, Missy. She is not kept on my property. I pay to board her in Franklinville while I am at school. Otherwise, I keep her at my Aunt’s farm in Doylestown, PA when I go home for long breaks (i.e. summer break). Q. What’s your favorite type of riding and why? A. I absolutely love barrel racing. I like the adrenaline rush, and I love the fact that is all about fun. Also, it is way more casual than most English disciplines. Q. 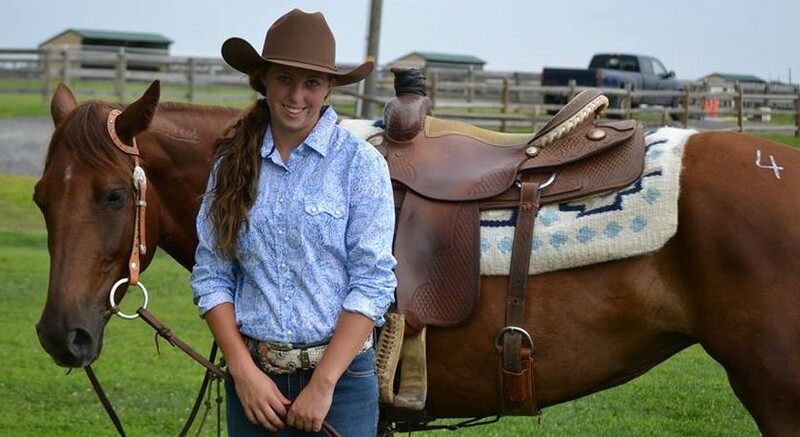 What advice would you give to a younger person interested in riding and showing? A.The advice that I would give someone interested in riding and showing is start small and work your way up. The only way you can get into the horse world is by jumping in with both feet. You have to go to a farm that is around you and see what they have to offer. Take a few lessons in every discipline and figure out what you like best, and never stop absorbing information. In my eyes, the greatest horseman is never done learning. Take any chance you can to pick someone else’s brain for what they know about horses. The people who think they know it all are the ones that do not make it very far.